The possible unreliability of memory is one of those plot hooks that will catch my interest every time. Give me a story about amnesia, lost memory, or conflicting memories, and I’ll at least consider giving it a try. Add in a World War II English setting and a cold-case mystery, and I’m in. 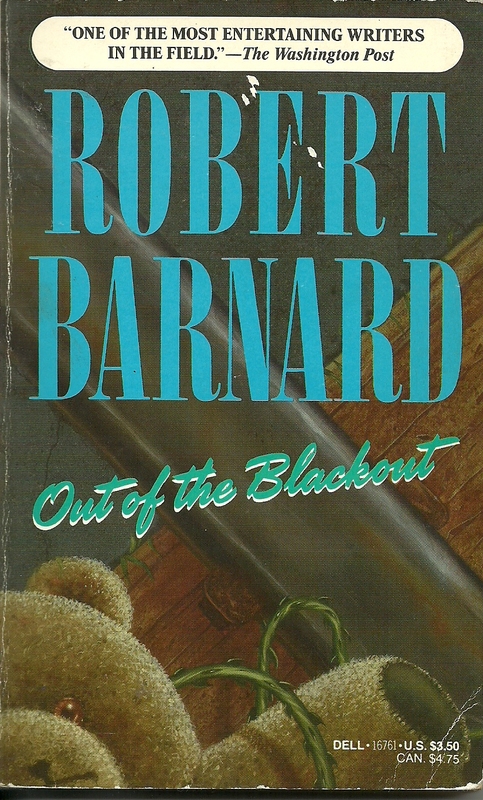 Robert Barnard’s novel Out of the Blackout begins with a 5-year-old boy on a train of evacuees who come to the country town of Yeasdon to escape the London air raids. The boy says his name is Simon Thorn, but that name doesn’t appear on any of the lists; there’s no record at all of his existence. The street where he says he lived can’t be found. The Cutheridges, a childless couple whose evacuee had ended up staying in London, take him in and listen to his pained cries in the night, and they quietly hope that he’ll stay with them for good. He was conscious that for the first month at Yeasdon he had had a nagging feeling of guilt at deceiving the Cutheridges. Could a child that young feel guilt? Perhaps that was the first dawning of a moral awareness, Foolish, of course, to feel guilty now. What was done was surely done on orders, or at least under influence too strong for a mere child to resist. And he had half understood that the Cutheridges had wanted to be deceived. But looking back, he could feel kinship with that guilty child—ingratiating himself, deceiving, suffering guilt. The book shifts quickly from mulling over memory to being a more straightforward investigative story, but one in which the investigator has a personal stake in the answer. Simon interviews neighbors, pores over newspaper clippings, and eventually finds the people he believes to be his family. He tries to get close to them without revealing who he is. Gradually, he starts to put together a tragic and horrifying story that he is convinced is accurate, but he cannot know without drawing it out of this family. The central mystery of Simon’s past is not so full of twists and gimmicks as to be ridiculous, but there are enough surprises and misdirection to satisfy. The cleverly done mystery was my favorite aspect of the book. The psychological angle never quite reached the level of complexity I enjoy so much in the work of Ruth Rendell/Barbara Vine. For psychological crime and mystery novels, she remains the gold standard. The characters here are not badly drawn, but they don’t have that much depth to them. However, I still enjoyed the book a great deal. It was a quick read, and I eagerly gulped it down. You make Out of the Blackout sound worth reading. I like the sound of this — must look out for it — thanks! Great! Hope you’re able to find it! This sounds like exactly my sort of book too! I’ve always loved a good English mystery — I’d never heard of this one, so thanks for the heads up! I’ve already checked and the library does have a copy. Thanks! I’m glad you were able to find a copy. I hope you enjoy it. Robert Barnard is a very prolific mystery writer–even now, in his late seventies, he is still publishing at a rapid pace. It’s true, he’s no Ruth Rendell or P.D. James; he works quickly and his books have more humor and satire. Generally, his work (include his short stories, which are very good) contain a completely unexpected twist at the end (sometimes in the last sentence) which changes our whole understanding of the story. If you’re looking for something a little lighter (and shorter), I’d recommend picking up a Barnard. Thanks for the info on Robert Barnard. I’d never heard of him before I ran across this book. I’m glad to hear his other books are good. This didn’t have much humor, but it did have a good twist toward the end. I don’t remember hearing of Robert Barnard before, but this sounds really intriguing. Like Karen K. I’ve found my library has a copy. I’d never heard of him before either, but as Deb says, he’s been around for a while and is rather prolific. Nice to discover a new-to-me mystery author. I think The Lion, the Witch, and the Wardrobe and The Distant Hours are the only books I’ve read about evacuees. This was much better than The Distant Hours. I’ve never read Good Night, Mr. Tom, but I wouldn’t say your tastes run to the saccharine! At least not generally. One of the Deborah Crombie’s mysteries, Kissed a Sad Goodbye, involves evacuees (past and present experiences). Evacuees also play a major part in Connie Willis’ Blackout and All Clear. I’m very intrigued to find out the mystery behind this character and how he came to be all alone, without his family.